In Massagno on a beautiful park of 3740 sqm lies Villa Elisa, a wonderful stately home built in the twenties. Located in an exclusive,very sunny and quiet residential area it enjoys of a beautiful view on the lake, the city and on the surrounding mountains. Lugano is only a few minutes away. 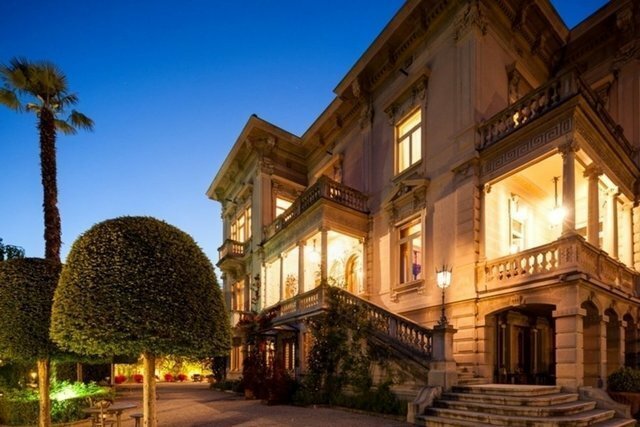 Villa Elisa built in 1925, was recently high-end renewed. The original and typical details of the old building were preserved during the works. In the villa has marvellous stained-glass windows, an impressive fireplace, old parquet floors and stucco decoration, antiquarian doors and precious wood panels. The technical parts (domotics, lift, heating system, electrical plant and cables, alarm system and air conditioning …) were brought to highest standards. The villa has a living area of approx. 1029 sqm on 4 floors and additional 300 sqm on the basement. Splendid and magnificent living rooms and parlours, 8 fine bedrooms with romantic balconies and terraces, wonderful bathrooms, three top equipped kitchens, a fantastic, spacious and temperature-controlled wine cellar, a vault room and many service rooms. The dependence has a lovely apartment 75 sqm apartment. Villa Elisa an amazing historical property, close to town.